3 Nights/4 Days, min. 2 pax (FIT). Special price for GIT. (1 room for 2 pax + daily abf + transfers + 2x tours (morning tour + lunch & noon tour + dinner). Plus extra night if stay more than 3 nights. Hotel locations: Kuta/Legian/Seminyak/Batubelig/Berawa (sunset beach), Jimbaran (sunset), Nusa Dua & Tanjung Benoa (sunrise), Sanur (sunrise), Denpasar (city hotel), South Bali (cliff), Ubud (artist resort). 5 star hotel: from US$ 395 - 749/pax. Sgl sup. (1 room for 1 pax) from US$ 225 - 350. Child + X-bed: US$ 199 - 399/child (2-12 years). 4 star hotel/plus: US$ 345 - 850/pax. Sgl sup. US$ 185 - 599. Child + Xbed: US$ 175 - up. 3 star hotel: from US$ 295 - 599/pax. Sgl sup. US$ 135 - 350. Child + Xbed: US$ 145 - up. 2 star/1 star/3 Jasmine/2 Jasmine hotel, the quotation price on request. Golf course package on request: Bali Handara - Nirwana T. Lot, Nusa Dua and the grand Bali beach. Over night package around Bali: 2N Ubud/2N Sidemen/2N Candidasa/2N Amed/2N Tulamben /2N Lovina/2N Pemuteran/2N Bedugul/2N Medewi/2N Pelaga/2N Batur/2N Putung/2N Munduk/Belimbing. Special packages like: meditation, educational dances & cooking, adventures: trekking, diving. Sport, Golf, hinterland visit, SPA. 3N/4D in Bali continue 3N/4D in Lombok/ Yogyakarta-Solo/ Bromo/ Komodo/ Kalimutu/ Toraja/ Ambon/ Manado/ Biak/ Medan/ Overland: Jakarta - Bogor - Bandung - Yogyakarta - Solo - Bromo - Malang - Denpasar, Bali (reverse). then return to Bali for 1N/2D. Hotels: Kuta/ Nusa Dua/ Jimbaran/ Tanjung Benoa/ Sanur/ Ubud. Quotation of the price on request. GSA VILLA & HOTEL RESERVATION INCLUDE TRANSFERS AND ONCE TOUR FREE. There are 250 hotels in Bali, from Jasmine 1, 2, 3; Star 1, 2, 3, 4, 5 and deluxe villas. Hotel locations: Kuta/Legian/Seminyak (sunset), Sanur (sunrise), and Nusa Dua (private sunrise beach, 5 star hotels, grand villas & golf). Tanjung Benoa (Jasmine up to 4 star hotel, water recreations), Jimbaran (sunset & beach baking fish dinner), Bali Cliff (cliff resort), Denpasar (city hotel), Ubud (artist resort, deluxe villas), Tulamben (diving), Lovina (dolphins), Pemuteran (Diving & Snorkeling), Candi Dasa (Beach Resort), etc. Bali Handara (golf), Nirwana Resort (golf), Pelaga Wana (agri-resort bungalows), Sidemen (valley resort). Price US$ 10,- up to US$ 1,500.- per room per night. ONE DAY TRIP PACKAGES (CULTURE, ADVENTURES, CRUISES) IN BALI, LOMBOK AND YOGYAKARTA. Travel Packages from Bali to Australia, Singapore, Thailand, Hongkong, Japan, USA, Europe, Africa, New Zealand, Fiji, Asian, China, etc. BUS/VAN CHARTER AND RENT CAR RESERVATION SERVICE (For family & Group). EXPATRIATE SERVICES (working permit, staying permit, extend and business visa). 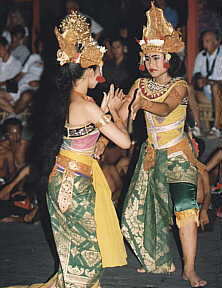 BALI-INDONESIA DANCER ARTISTS ABROAD PERFORMANCE ORGANIZER. MEETING AND INCENTIVE PACKAGES (Pre arrangement, management assistant, operation). All brochures, You may find at the Airport of Ngurah Rai Bali and all hotels in Bali or may request for being sent. Looked for merger companies in every state in the world about Bali - Indonesia Travel Business. Payment can be by credit card or transfer. Booking and confirm soon, you will have a special souvenir from Bali Avia Tours. Denpasar, Bali, Indonesia. PO BOX 1094, Airport Ngurah Rai, Bali. Tel: (62-361) 751-257, 755-840, 757-370, 724-276 * Fax: (62-361) 720-620, 752-282.